On a cold early evening in March, I was part of a group of hardy birders who came to the banks of the Hackensack River at Laurel Hill County Park in hopes of witnessing the whirling Meadow dance of the woodcock. As our group waited patiently for the Timberdoodles to broadcast their first “PEENT” call of the night we instead heard a distinctive “Quock” sound from overhead. One, than two, and finally 19 owl-like images flew out of the rapidly darkening skies directly over our heads. 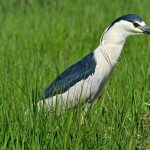 All were Black-crowned Nights Herons, providing for one of those natural magical experiences that often occur in the Meadowlands, a sure indication of a cleaner and healthier environment. 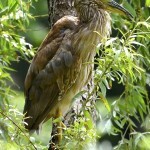 The Black-crowned Night Heron has suffered throughout its history, first from feather hunters in the 1800s and later from the ravages of the pesticide DDT and habitat destruction, forcing New Jersey to add the bird to its list of threatened species in 1999. By the late 1990s, there were still only about 200 of the birds in the State. 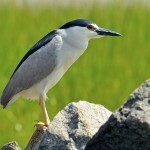 Thankfully, with the vast environmental improvements made in the Meadowlands over the past 20 years, Black-crowned Night Herons can now be seen in most areas of the region, whether perched on the railing of DeKorte Park’s Marsh Discovery Trail or quietly peering down at you from a low tree branch at Losen Slote Creek. They rest during the day for the most part and forage a diverse menu at night, hunting everything from fish, insects, and crabs to birds, eggs, and sometimes even fruit.